Do you have a guest house, cabin, or cottage that is used by paid or unpaid guests? 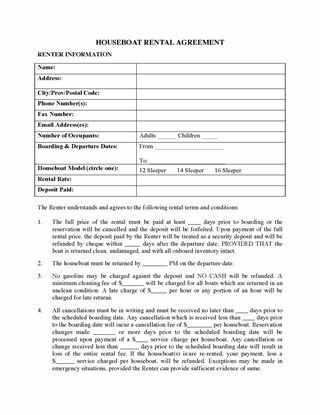 Protect yourself from claims and liability with this Waiver and Release Form for Use of Guest House. The Waiver form should be signed by the guest(s) prior to their use of the guest accommodation. The guest acknowledges potential hazards and assumes all risk for him/herself and any child in his/her party. The guest releases the property owner from liability and indemnifies the owner against any claims or actions arising as a result of the guest's use of the accommodation. Buy the form, download it, and it's yours to use as often as you like. Don't get sued for loss or damages by a house guest. 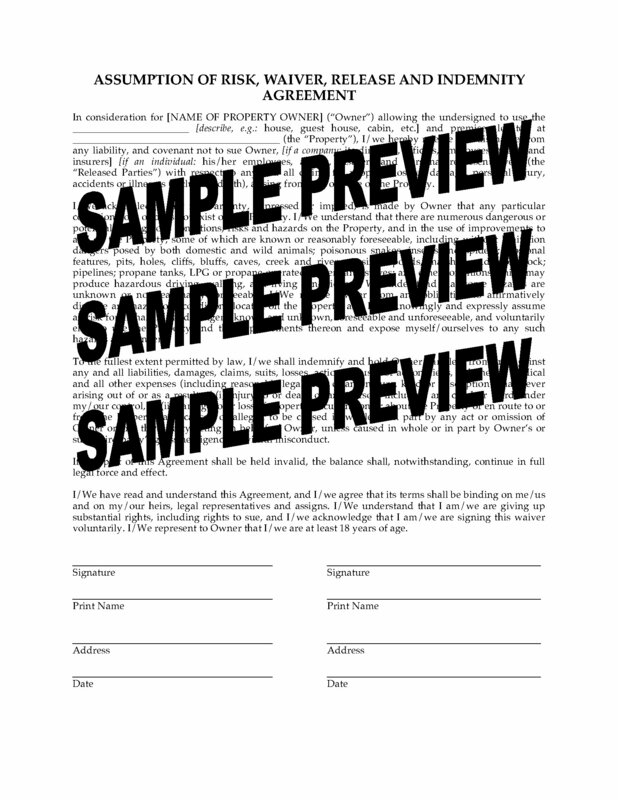 Add the Waiver and Release form to your cart, check out, and download it. You can easily personalize it for each guest's stay. Houseboat rentals can be a very satisfying business. Rent houseboats to vacationers in Canada with this ready-made Houseboat Rental Agreement. The renters must pay the full rental price before boarding the houseboat. If the reservation is changed or cancelled after a specific date, an additional fee will be charged. The houseboat rental company is not responsible for loss or delays due to weather, equipment failure or other unavoidable circumstances. The renter indemnifies the rental company against claims for loss, damage or injury. 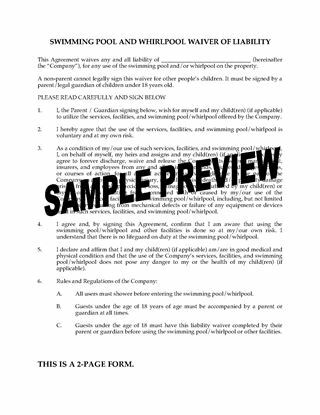 This is a reusable legal form template which you can customize for your business and use as often as you like. Save money on printing costs - only print what you need when you need it. The Canada Houseboat Rental Agreement is downloadable and affordable. You can use it in any province or territory. Do you have a boat that you can rent out when you're not using it? Make money on boat rentals with this easy downloadable template for Canada. 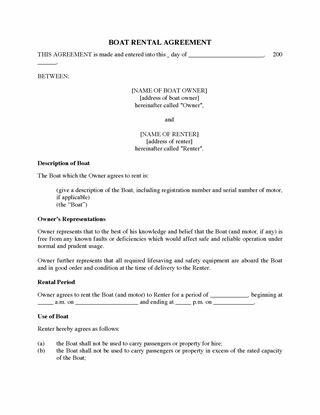 You can use this legal contract to rent your boat, motor and boat trailer. The renter agrees not to overload the boat or to use it in a negligent manner. The renter must not allow any other person to operate the boat without written permission from the owner. The renter indemnifies the boat owner against claims or damages arising out of the renter's use of the boat. The Canada Boat Rental Agreement can be used in any Canadian province or territory. Rent out your summer home, vacation cottage or recreational property in Ontario with this Vacation Property Rental Agreement. fees payable for no-shows, changes or cancellation of the reservation after a certain date. This Ontario Vacation Property Rental Agreement is in MS Word format, and is fully editable to fit your particular circumstances. Hiring a contractor to do construction or renovation work on your property? Protect yourself against injury claims with this USA Waiver and Release of Homeowner by Contractor form. The contractor should sign the release form before starting the work. The contractor releases the property owner from any and all liability, and acknowledges the risks associated with the construction. The contractor assumes all responsibility and waives any claims he/she may have with respect to injury, damage or loss resulting from the performance of the work. 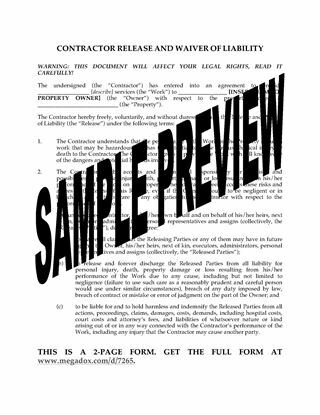 This USA Waiver and Release of Homeowner by Contractor template is provided in MS Word format, and is fully editable to fit your specific circumstances.